1. 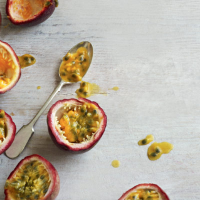 Halve the passion fruit and scoop out the pulp. Pass through a sieve into a pan. Keep half the seeds and discard the rest. 2. Add the orange juice, lemon juice and sugar to the pan and heat gently, stirring until the sugar dissolves. Bring to the boil, then simmer until syrupy and reduced by half. Add the reserved passion fruit seeds, then cool completely. 3. Put the orange segments in a bowl and pour over the syrup. Chill before serving with spoonfuls of Greek yogurt or vanilla ice cream.